I wrote a piece Pedestrians are fine, don’t fine pedestrians at WalkSydney. The Sydney Morning Herald presents an opinion that It’s futile and yet police persist in fining jaywalkers. This is our sad reality, pedestrians, who cannot of themselves do much damage, are fined, while cars, which can kill in the blink of an eye, proceed unscathed. The stated argument for criminalising “jaywalking” (not an actual crime, but rather a slander on people crossing spaces that used to be free to cross) is that in an environment where automobile drivers only pay attention to lightbulbs, rather than the environment around them, people would be at risk for crossing against said lightbulbs. And so to prevent such risk, jaywalking must be made illegal. While actual pedestrians are the first to recognise that drivers pay less attention to the world around them than they should, this is not despite lightbulbs, it is because of them. The traffic signs, signals, and markings are themselves a distraction from human-to-human interaction, the eyelock we engage in before crossing paths in humane environments. Should government subsidize transport? If government subsidizes transport, should it subsidize producers or consumers? If a government gave money to consumers, they could spend it on what they want, paying for a service, which if it covers operating costs, could lead to more investment. If it gave money directly to producers, they spend it on more supply. Which leads to a better outcome? I am honoured to report that I have been invited to give the 12th Annual Martin Wachs Distinguished Lecture in Transportation, Thursday, May 16, at the UCLA Campus. Registration via Eventbrite. The 30-minute isochrone has long defined people’s use of cities — from ancient times through the trams era to modern times. Networks and land use co-evolve with technology subject to the constraints of available time. There are opportunities (low-hanging fruit) to use design to reduce the costs of travel and thus increase access for relatively little monetary outlay. This talk discusses both the measurement of accessibility, why it matters, and how it might affect traveler behavior, institutional behavior, and public policy. Looking at data from rail and tram development in Sydney from the 1800s and Australia today, implications about the effects of accessibility will be described. David Levinson is professor in the School of Civil Engineering at the University of Sydney and adjunct faculty in the Department of Civil, Environmental, and Geo-Engineering at the University of Minnesota. Levinson received the 1995 Tiebout Prize in Regional Science for the paper “Location, Relocation, and the Journey to Work.” From 1989 to 1994, he worked as a transportation planner, developing integrated transportation and land-use models for Montgomery County, Maryland. He has a PhD in transportation engineering from Berkeley and his dissertation “On Whom the Toll Falls,” argued that local decision-making about managing and financing roads will most likely lead to direct road pricing, which will allow the efficient allocation of scarce road resources (and thus reduce congestion). Now in its 12th year, the annual Martin Wachs Distinguished Lecture draws innovative thinkers to the University of California to address today’s most pressing issues in transportation. Created by students to honor Prof. Wachs upon his retirement from the university, the lecture rotates between Berkeley and UCLA, the campuses at which he taught. Dealing with the 5 Ps of access. Elisabetta Vitale Brovarone Dealing with the 5 Ps of access. Review of Elements of Access: Transport Planning for Engineers, Transport Engineering for Planners. Journal of Transport Geography 72 p. 274. “There is an indissoluble link between land use and transport. It might sound hair-rising to those who theorised the positive utility of travel, but basically, most of the time we spend travelling is to reach places where we can carry out activities. Since the pioneering studies of Robert Mitchell and Chester Rapkin in the ‘50s, several scholars have studied the link between land use and transport and tried to foster a constructive dialogue between these two domains. Nevertheless, they are still deeply separate, in terms of disciplines, professions and planning domains. The automobile has been pitched as a machine for freedom. But you travel caged inside a small metal box, strapped to your chair, while your life is being threatened randomly by high speed two-ton projectiles, forced to keep eyes focused on the road and obliged to place hands at the 10 and 2 o’clock positions on the wheel, with your foot constrained to a small area on the floor. This doesn’t sound like freedom to me. If you choose to enter a freeway, you are not even permitted to leave your car til you exit the road. On streets, your behavior is governed by inanimate traffic lights, signs, and paint, which are violated at penalty of automatically generated fine or imprisonment. This is all self-imposed, so it is more like committing yourself to an institution, the automobility asylum, perhaps, than prison which is imposed by others. An alternative view is that freedom is not ensconced in a machine but in a way you can interact with the world. If you can, at your whim, when you want to, do what you want, engage in the activities you want, without fearing for your life, that is closer to freedom. Jarrett Walker argues frequency is freedom. This is closer to the truth. While on a bus or train I am still caged in a metal box, it is a larger box, I am not strapped in, and I am much safer. I am also now free to do something with my time while in motion, not constrained to monitor the road. And where can I travel in these safe freedom machines, reaching many more opportunities? Cities. This gives a new meaning to the expression: Urban air makes you free. ‘But I can reach more places in a car than on transit in the same amount of time, almost everywhere,’ you argue. This is true, if you ignore the costs you impose on society, if you ignore the fixed costs of that opportunity to you, and if you ignore the ability to use time in some other way, as is available when not driving. Freedom from car ownership, freedom from the obligation of driving, and freedom from negative externalities borne by the community at large are how we should reframe transport and land use goals. What can we do to give people those freedoms? Connectivity is good. Is more connectivity better? During the early stages of a useful technology like roads or transit, adding links generally adds more benefits than costs. However there are limits. A four way intersection is good does not mean a five way intersection (or six or seven) is necessarily better. The more complex intersection adds to the friction of travel and cost of construction over its simpler alternatives. A grid network, with streets at 90-degree angles to each other might not be as good as a network with streets at 60-degree angles, which reduces travel costs and increases directness (reduces circuity), but it is most assuredly better than a fine mesh with streets at 10-degrees or 1-degree, where almost all is pavement and little is actually buildable land. While 1-degree network would reduce surface travel distance, it does so at many other costs, including a reduction in accessibility because of fewer development opportunities. The optimal level of connectivity depends on what you are trying to optimize. Hypo: From Ancient Greek ὑπο- (hupo-), combining form of ὑπό (hupó, “under”). Hyper: From Ancient Greek ὑπέρ (hupér, “over”). I would maintain that most developed countries are pretty close to optimal in terms of road connectivity, that there are few missing links whose costs outweigh their benefits. 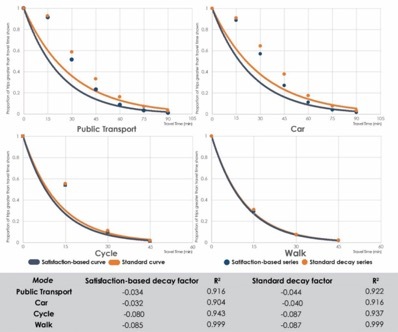 If subsidies for modes were to be eliminated, some large cities might be under-developed in terms of transit connectivity because of a bias towards coverage (and circuity) aims rather than frequency. Let’s think of this in the context of induced demand. More connectivity in one sense means a faster network, which users exploit by traveling longer distances in the same amount of time. They gain utility by being in a house they prefer. However they use up the capacity gains of the network. But more connectivity increases the friction of connections (junctions, interchanges, transfers) which slows down the network. Induced demand due to connectivity is thus self-limiting. Braess Paradox is the most famous supply side example of hyper-connectivity. In this situation, removing a link improves travel for road users at large because the additional network link induces travelers to use a link with a lower average cost but higher social marginal cost. A key point is that whether a network is over or under-connected depends on the technology of travel, as well as the amount. A network which is overconnected for cars may be underconnected for pedestrians who don’t congest so easily. A network which is overconnected for 2000 cars may be underconnected for 1000. This is the challenge in building cities. Networks last for seemingly forever, but technologies that use them change more frequently. How can you design a permanent infrastructure flexible enough to serve future technology? I am pleased to have now completed my Access Quartet of books. These are artisanally selected from the last decade or so of my popular writings, including for the Transportist blog and elsewhere, along with new words to enhance their completeness. They are organized so that they can be read independently, though an astute reader will identify several themes that run through them all, most obviously the need to privilege considerations of access when considering behavior, deploying technologies, designing infrastructure and networks, and deciding what to fund. The books are beautifully laid out in the Tufte-latex template for clear information presentation and ease of reading. All are available in hardcover, paper, and PDF. I thank my coauthors on the books, Kevin Krizek for The End of Traffic and the Future of Access, Kay Axhausen and Wes Marshall for Elements of Access, and David King for A Political Economy of Access for their contributions and extensive editing of my own writing. Each book also had numerous reviewers, who also made the books better. You should read them all. Polycentricity, or the number of central urban places, is commonly measured by location-based metrics (e.g. employment density/total number of workers, above a threshold). While these metrics are good indicators of location ‘centricity’, results are sensitive to threshold choice. We consider the alternative idea that a centre’s status depends on its connectivity to other locations through trip inflows/outflows: this is inherently a network rather than placeidea. Three flow and network-based centricity metrics for measuring metropolitan area polycentricity using journey-to-work data are presented: (a) trip-based; (b) density-based; and (c) accessibility-based. Using these measures, polycentricity is computed and rank-centricity distributions are plotted to test Zipf-like or Christaller-like behaviours. Further, a percolation theory framework is proposed for the full origin–destination matrix, where trip flows are used as a thresholding parameter to count the number of sub-centres. Trip flows prove to be an effective measure to count and hierarchically organise metropolitan areas and sub-centres, tackling the arbitrariness of defining any threshold on employment statistics to count sub-centres. Applications on data from the Greater Sydney region show that the proposed framework helps to characterise polycentricity and sub-regional organisation more robustly, and provide unexpected insights into the connections between land use, labour market organisation, transport and urban structure.